Meet The Girl Who is Not Allowed To Leave House Alone Because Of Her Beauty. 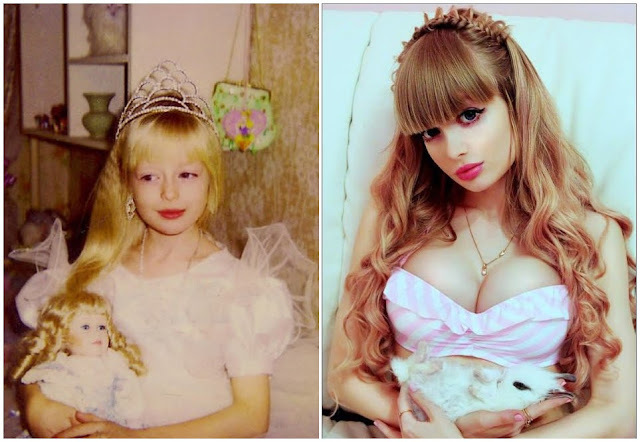 This Russian girl is so beautiful that she almost never goes outside alone because her parents are afraid that something will happen to their daughter. When you look at her, it seems like she's a real Barbie. Tha amazing fact is, that she never did plastic surgery. Her body and face are completely natural. Of course, she's tired and bored living in a golden cage. Now she's 26 years old, but she still needs her mother to put on her clothes. There is no doubt that this is, of course, a terrible world. Angelica Kenova almost never leaves her house. If she does this, it is only when she's flanked by several bodyguards. Apparently, she is so beautiful that her parents decided to protect her in this way. According to her "Cosmetic procedures are needed only when a person has serious defects of appearance ." She adds: "My parents raised me like a princess, not allowing me to leave the house, or to communicate with boys. As a result, I'm not fit for real life. I'm like a living doll. When I was a child, my parents called me Barbie. So I was just programmed to look like this." Angelica claims that she never did any cosmetic procedure. Her beauty is completely natural. Now she is 26 years old, and her dream is to leave her house and get rid of constant surveillance and protection. According to her: "My parents spent my whole life holding me in a glass palace. And I want to be released! "